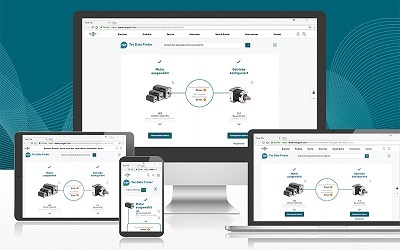 Neugart has made an innovative online configuration tool available which is extremely user friendly, even when used on tablets and smartphones, with the enhanced Tec Data Finder (TDF). The TDF from Neugart can now also be used on mobile terminal devices when you are out and about. The flexibly designed layout automatically adapts itself to the mobile terminal devices thanks to its responsive design. The high degree of user-friendliness is therefore also present on smartphones and tablets. Another advantage of the new version is the flexible configuration start. The user can chose whether to start configuration with the motor or the gearbox. The TDF checks the geometrical compatibility of the gearbox and motor. The motor selection or gearbox configuration is restricted depending on the start variant. This means that only gearboxes that can be attached to the motor are displayed, or only motors that can be attached to the gearbox. New users will also benefit from the illustrated explanations during gearbox configuration, which makes quick and easy configuration possible. The TDF is also suitable for engineers and users from other specialist areas. As well as the intuitive configuration, the TDF also allows you to have the gearbox configured for the motor automatically at the push of a button. With more than 17,000 motors, all of the most popular motor manufacturers are available for selection to the user. If a motor is missing, users can create their own motor data. Entry is supported by interactive input fields in which the required motor value is highlighted in colour in the technical drawing. The motor data can also be entered in using metric units or imperial units, i.e. the Anglo-American system of measurement. Another highlight is the option of being able to compare up to five gearboxes. Differences within the technical data are highlighted in colour with a single click. It is immediately apparent to the user which gearbox optimally covers the technical requirements. CAD models, technical datasheets and quotes can be requested after configuration. Registered users also have access to previous configurations via the user account. This makes it easy to re-use CAD models, technical data sheets and quote inquiries. The compatibility with the Neugart Calculation Program (NCP) is also user-friendly. The TDF simply checks the geometric attachment capability of the motor to the gearbox. The free NCP calculation software is available for dimensioning and checking the application-related parameters. Once the gearbox/motor combination has been configured in the TDF, an NCP control system file can be downloaded. The file can then be imported into NCP. The configured gearbox/motor combination is automatically created in NCP, and all that the user needs to do is enter the application data in order to calculate the entire drive train. The NPC design software is available for downloading free of charge.